Ridley Scott knows how to make a movie. From big action set-pieces to small character moments, his films are made with care and precision. Even his weakest films are still masterfully crafted. Ridley Scott can be called a lot of things, but lazy isn’t one of them. So why is it that Exodus: Gods and Kings is so boring? I blame the source material. Anyone who has read large portions of the Bible can tell you: there’s not a lot of character development. By nature, the Bible is very plot heavy. This happened, and then this happened, and then this happened. Just a ton of “and thens” as opposed to “therefores.” The only reason anything happens seems to be “because.” Despite being almost two and a half hours long, it feels like a lot of footage was cut. While I don’t believe that to be the actual case, the pacing is weird. In one instant, Moses meets a woman. In the next, they’re married. Cut to a title card stating 9 more years have passed, and now Moses needs to abandon his family for his cause. It’s kind of jarring. The cast doesn’t do the story any favors. Christian Bale’s Moses feels out of place, and his jambalaya of accents makes a lot of his dialogue unintelligible. You can see the effort he puts in, but it never feels like anything but a performance. Joel Edgerton misses an opportunity to chew some scenery as King Ramses, but instead offers a rote villain ripped from the pages of, well, The Bible. Sigourney Weaver has maybe three lines in the whole thing, and absolutely no function as a character. The only actor who really shines is John Turturro, but he’s mostly a non-character as well. Visually, Exodus is marvelous. There is a healthy mix of CGI and practical stunt work that makes the battle sequences really pop. I will live and die happily never setting foot in a chariot. Those things are brutal! The sets are a wonderful mix of practical and computer effects as well. Never does it feel like Naboo. Everything feels real. Sadly, by the time we get to much of the action, it doesn’t have any weight. Why build such a real world if you’re not going to populate it with interesting people? And the plague sequence, in a different movie, would be some next level stuff. In this case I was so numb by the time it arrived, that it was easy to dismiss. It’s impossible to write a review of Exodus without addressing the race controversy and the ensuing boycott of the movie. While it is my intention to view each and every movie in a vacuum, movies are cultural items by nature, so it is my duty to offer my two cents. If you’re not aware of the controversy I speak of, it’s as simple as this: there are people who take offense that the slaves and thieves in the movie are depicted as people of color, while the lead characters are predominantly white. 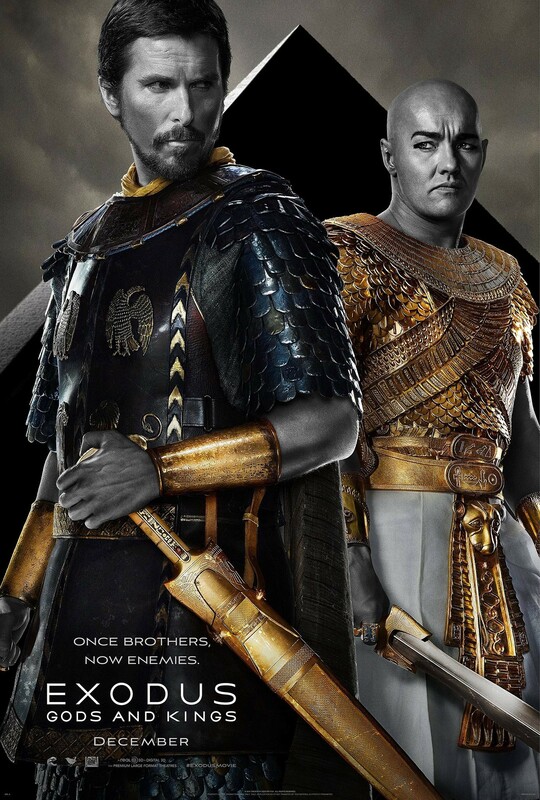 Exodus is being touted as one of the more egregious examples of whitewashing in Hollywood, and while the racial disparity seems obvious in the promotional material, it’s not so glaring in the context of the movie. Still, it’s hard not to notice it. That being said, Ridley Scott’s defense, although extremely poorly worded, is pretty valid: getting funding for a Christian Bale movie is much easier than for a movie cast with no-name actors. It’s a business decision, not a social commentary. THAT being said, this speaks to a larger problem in the industry: Why are minority actors less of a box office draw? That being said, I must say I’m supportive of the boycott. The racism on display is systemic, and a boycott of the movie sends the statement that audiences won’t spend money on such a product. And it sends the message to the right people. Finally, with THAT being said, if a movie were to be released that exhibited the type of casting that the boycotters desire, they are behooved to complete their message by purchasing a ticket. Me? I see the story as pure fiction, so the race of the characters is irrelevant. It’s like if Superman were cast Hispanic: cool by me as long as the movie is good. And now that that’s out of the way, I must answer that very question: Is the movie any good? No, not really. Exodus: Gods and Kings opens today in Philly area theaters.